This class is brand NEW – you will learn how to work with cold wax and then create contemporary/abstract landscapes! If you love encaustic, but are afraid of fusing, this workshop is for you. This is the new medium that everyone is talking about. It’s very popular! Cold wax looks similar to encaustic. 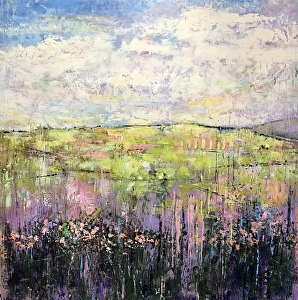 Artists in this workshop will explore methods of building up paintings in layers using cold wax medium, tube oil paint, powdered pigments and other media. You will also find new ways to create textures, lines, scratching back to previous layers, adding collage using a variety of tools and techniques. No prior knowledge in using oil. A FUN class, with lots of demonstrations! BE SURE TO CHECK Linda’s website for the materials list. There is an additional $35 supply fee that will be paid to the instructor the day of the class. Please use the link below to sign up for the class.